To learn more, visit AgilQuest. "It's like Airbnb for office space, but it's more than that. Who would have thought that a company could have legitimized hitchhiking? It's called Uber. Who would think that they would share their home with somebody else and charge them a fee to stay there? Three years ago you would say you're absolutely mad. But now it's not unreasonable to think that a company with excess office space would share it with workers from outside the company for a fee." Since 2013, the federal government has quietly carried out a decidedly unsexy sustainability mission. The White House’s “Freeze the Footprint” policy states that federal agencies are not allowed to increase their leased square footage and, where possible, must take steps to reduce it. The Department of Homeland Security’s internal mandate is to reduce what they term “usable space per person” to a maximum of 150 square feet in each of their facilities. In the case of Customs and Border Protection, an agency housed within the DHS, some existing facilities “have a space utilization rate above 200 usable square feet per person,” says Aron Beninghove, an architect contracted by the CBP to help improve that metric. “From a sustainability standpoint, space reduction is a huge thing,” he says. “In most cases, we’re looking at making a significant reduction in the footprint.” In other words, the same number of workers will occupy much less space—which means a major reduction in building materials, energy usage, and everything else that goes into a government office—without sacrificing productivity. As it turns out, the solutions that CBP is implementing are actually improving worker productivity. There is also the not-so-minor detail that every square foot of space reduction represents savings in rent, construction costs, and operational expenses. Beninghove, as a government contractor with AECOM, acted as the facilities lead for CBP’s recent pilot program to reduce its footprint, for which employee mobility was the central strategy. The idea is simple: rather than each employee being assigned to a specific desk or office, a multitude of different workspaces are made available—ranging from private offices to collaborative workspaces, and everything in between—and employees pick and choose which one they need on a given day. Some employees constantly move about throughout the day so they may use a handful of different workspaces on an informal basis. Telework is also a huge component: by encouraging employees to work from home two days a week, workspace is freed up for those who actually need it. The first pilot project involved about 80 employees spread across two floors and nearly 14,000 square feet in one of CBP’s Office of Administration buildings in Washington D.C., who were consolidated onto one 8,700-square-foot floor with just 27 desks. The transformation will net a savings of $287,000 in rent each year, while the increased teleworking will save employees an average of $600 per year in commuting costs. The number of miles commuted by employees has been cut in half, resulting in a corresponding reduction in greenhouse gas emissions. Phase two was even more ambitious: 550 employees from seven floors in three buildings were brought together onto three floors in one building, resulting in a 46% reduction in square footage and a savings of $3.3 million per year in rent and operational costs. The increased use of electronic files, which went hand-in-hand with the new mobility strategy, has resulted in a 25% reduction in office paper use. In addition, 17% of employees reported an improvement in their sense of work-life balance. FREEZE THE FOOTPRINT: The White House's sustainability policy states that federal agencies are not allowed to increase their leased square footage and, where possible, must take steps to reduce it. Of course CBP’s employees didn’t just self-organize themselves into the new space sharing system. That part was left to AgilQuest, a Richmond, Virginia-based company that provides technology and professional services that support mobile workforce development and eliminate wasted office space. AgilQuest is well known among Fortune 500 companies throughout the world, as well as its many government clients, for OnBoard, its cloud-based workspace reservation software. Employees can reserve the space they need from their desktop tablet or mobile phone, as well as keep track of their colleagues’ schedule of meetings and whereabouts. The software also integrates with common workplace needs, such as catering, along with building automation systems that manage electricity, lighting, and HVAC usage. “AgilQuest provided us with a very proven solution for facilitating that whole idea of sharing space. Their online reservation platform makes it easy,” Beninghove says. AgilQuest’s software and service solutions support today’s mobile workforce and eliminate wasted office space. For more information visit www.agilquest.com. John Vivadelli, AgilQuest’s CEO and founder, launched the company in 1994 after reading study upon study showing that the average office worker in the US and Europe uses their office only 50% of the time during working hours. Prior to AgilQuest, he worked for IBM, who he says “in the late 80’s and early 90’s had a little problem of the stock price dropping by 70% and huge bottom line losses. 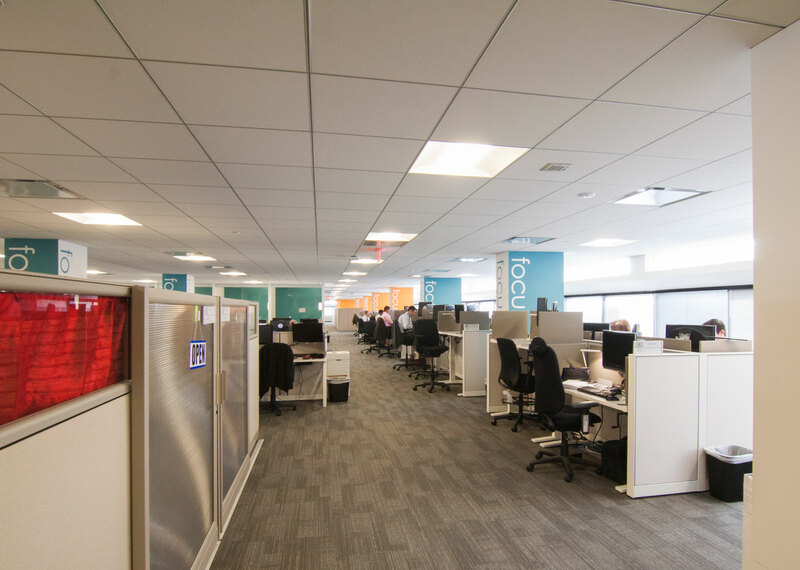 They needed to cut costs in order to survive, so they looked at their second largest expense, which is what real estate and occupancy tends to be for most organizations.” Vivadelli led the team that developed the workspace management tool that helped bring IBM back from the brink of insolvency. The overwhelming success of the AgilQuest model has not made Vivadelli complacent. He’s now expanding the concept to link a multitude of potential workspaces in every major city of the world through a new cloud-based platform known simply as AgilQuest.com, which will be released this summer. Rather than functioning as a discrete system within each corporate or government real estate portfolio, the new platform will go beyond those walls to allow workers to find suitable space when and where they need it, whether that’s up the street from their house at a café, or in the well-appointed video conference room of a global corporation. In essence, AgilQuest.com is a way for businesses to monetize the excess space that they have by renting it out to anyone who needs it whenever it is unoccupied. "How can an asset that is being used 50% of the time be called sustainable? If it's only used 50% of the time, it's using 50% too much material, creating 50% more construction waste, releasing 50% more wastewater runoff, consuming 50% more energy, and producing 50% more CO2 than it should." Clearly, Vivadelli and his team are not afraid to think big. The General Services Administration, another federal agency that utilizes AgilQuest software, recently integrated the building automation system of its Washington D.C. headquarters with the OnBoard and Commander BI platforms as part of a major renovation and technology upgrade. With the new system, each time an employee swipes their badge at the entry turnstile, OnBoard registers their presence in the building and sets a sequence of behind the scenes events in motion. The building automation system reads the schedule for that employee and primes itself to bring the various spaces that he or she will use that day up to a comfortable temperature, just in time for them to arrive. If they go into a conference room where they have a meeting scheduled, a sensor in the room turns on the lights, which in turn informs the OnBoard system that the person has indeed used the space that they reserved. If the meeting were to be cancelled at the last minute, the building automation system would inform OnBoard that no one was present, and the space would automatically become available again on the reservation system. Assuming the meeting does happen, five minutes before it is scheduled to end, the lights briefly dim to signal everyone in the room that another group may be waiting to use the space, so they are sure to finish on time. If no one else is scheduled for the space, the lights and HVAC turn off once the room’s sensors detect that everyone has left, and all of the data about how the space was actually used, versus how its use was anticipated, is logged by both the building automation system and AgilQuest’s Commander BI. Investing in such a high level of workplace utilization precision pays for itself very quickly: the GSA cut its operational costs by more than 50%—a total of $32 million annually in combined savings on leased space and associated service costs. The integration with smart building technologies has yielded an additional 10% annual savings on energy costs. In the process, the GSA has saved 16 million kilowatts of energy annually, and avoided the omissions of 16,000 metric tons of CO2. That’s definitely a story that attracts today’s most talented workers, which is perhaps the most important business strategy of all. An office building is no longer just a box for employers to stick their workers into. Today’s top minds see work as what you do, not as a place you go every day.